When I originally designed our timberframe house, I had in mind that we would use SIPs (Structural Insulated Panels) for the walls and roof of our house. 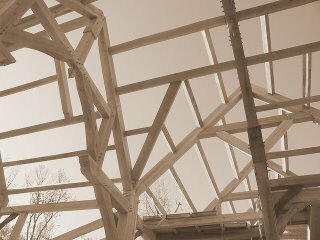 The SIPs would have provided adequate stiffening of the roof structure, so wayback, I had omitted any diagonal timber bracing in the roof. 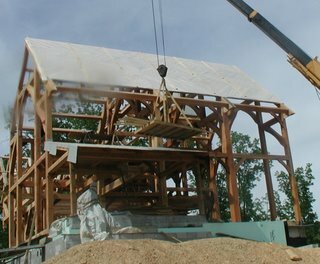 But for various reasons, I eventually decided to use the SIPs only for the walls of our timberframe house. Now that SIPs were no longer in the plan for the roof, I needed to stiffen the roof somehow. 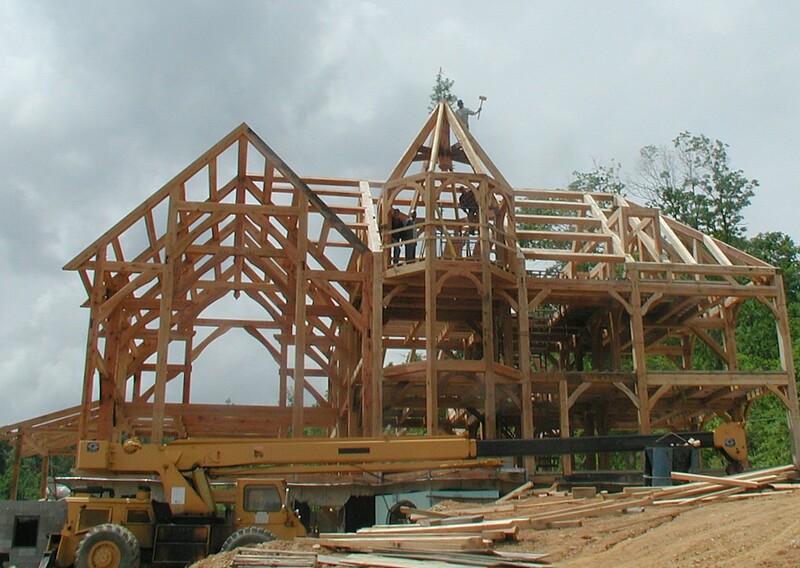 Some options that I considered were: (1) plywood sheathing, (2) hidden 2x6 braces above the tongue and groove ceilings, and (3) traditional timber braces. Option 1 was undesirable because of the addition of "manufactured" wood that was not from our farm. 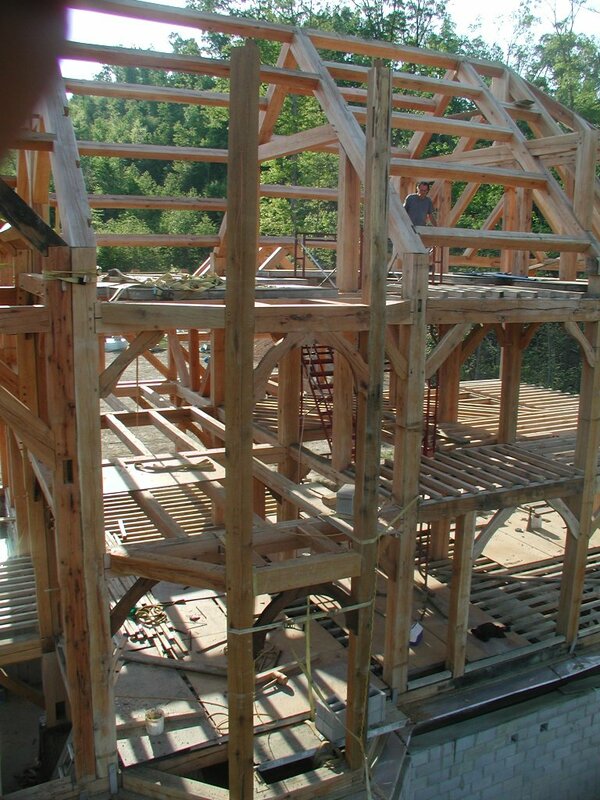 Option 2 just wasn't honest (hidden braces in a timberframe?!) and would have complicated the insulation. Option 3 would have been an inordinate amount of work, given that the frame was already raised. 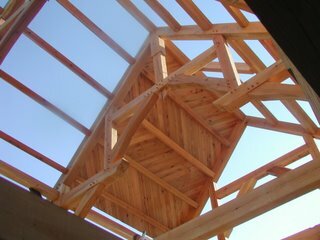 What I came up with was to run our tongue and groove ceiling boards on a 45 degree angle, and switch directions at every purlin. 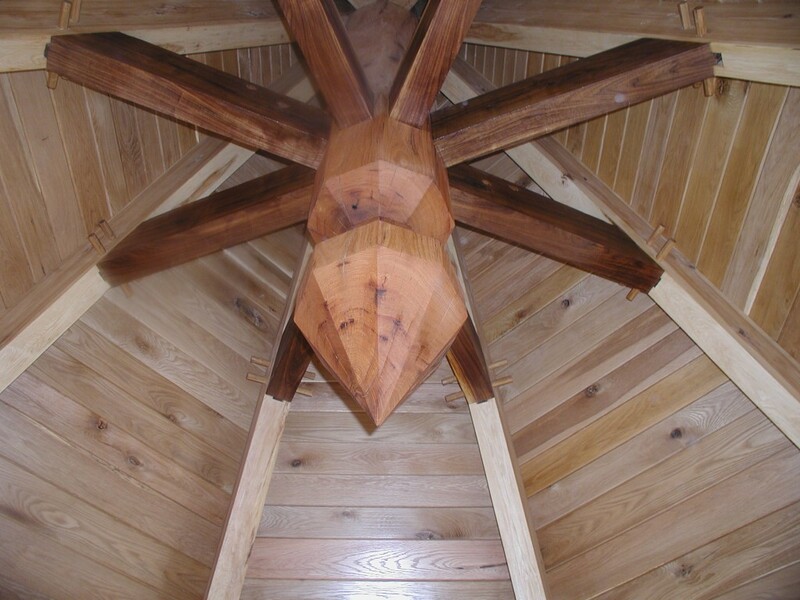 Every tongue and groove ceiling board that we added was therefore going to act as a corner brace in the roof plane. If one brace is good, then hundreds of braces must be even better. 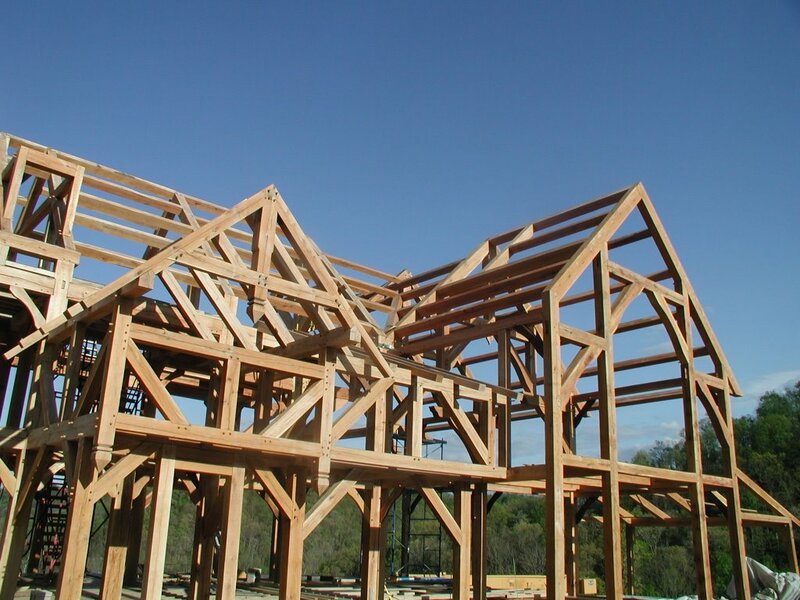 But this meant that each end of every board had to be cut on a 45, and all of the boards had to end on purlins. A lot of work... and if we didn't pay attention, a lot of waste when the ends of the boards got trimmed. But as it turned out, because we were careful, none of our waste pieces were ever more than 6" long. In the corner of every purlin-rafter intersection, we got a chance to use up the short boards. The weatherman predicted 5 sunny days in a row, which means I had an opportunity to make hay on our farm and get the tongue and groove ceilings down on the biggest plane (the south plane) of our roof and get it covered up. It took 4 of us 3 days to cut and put down about 800 square feet of prefinished tongue and groove and to cover it up with the temporary waterproofing (6mil plastic sheet) that will later act as our vapor barrier. You can see the clear plastic and temporary battens have been applied to the roof in the last picture. This would have been nearly impossible without safety harnesses, good rope, and the crane. OK, so there's a porch and an entry to add, and I forgot to mention those two little floor joists that go in the loft, and a few pegs need driven, but we're ready to box this frame in, so we're calling it DONE! I'll type a proper blog entry later, but for now here's a picture! YEEESSSS. Time to schedule the pig roast and the bluegrass band. We did it - literally, we did it. Every stick of wood in this frame is off of our farm. 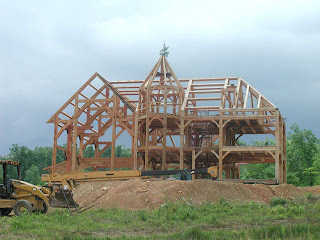 There are over 500 individual timbers in this house, and they were all notched here without ever leaving the farm. 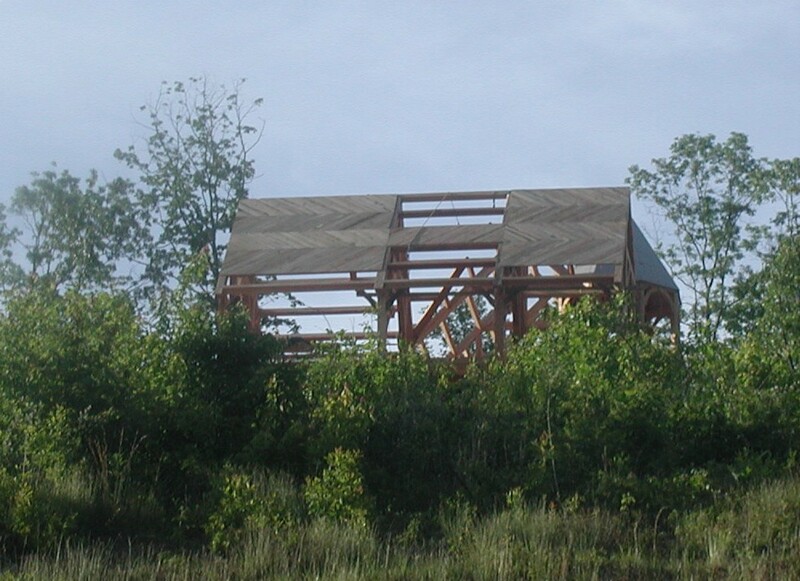 98% of the trees used in this frame fell as a result of an ice storm and would have otherwise rotted in the woods. The remaining 2% were comprised of standing dead white oaks and three red oaks cleared for the house site. There are at least a dozen species of wood in this frame, including red oak (northern red oak, scarlet oak, and black oak), white oak (true white oak and chestnut oak), basswood, yellow poplar, hard maple, soft maple, ash, hickory, walnut, locust (pegs), beech, sweet gum, and black birch. BTW, we're just getting started... Even though the timber frame is done, I'll be updating the blog with pictures of the house as we add the slate roof, photovoltaic panels, SIPs, stone exterior, porch, tongue and groove ceilings, fireplace, etc. 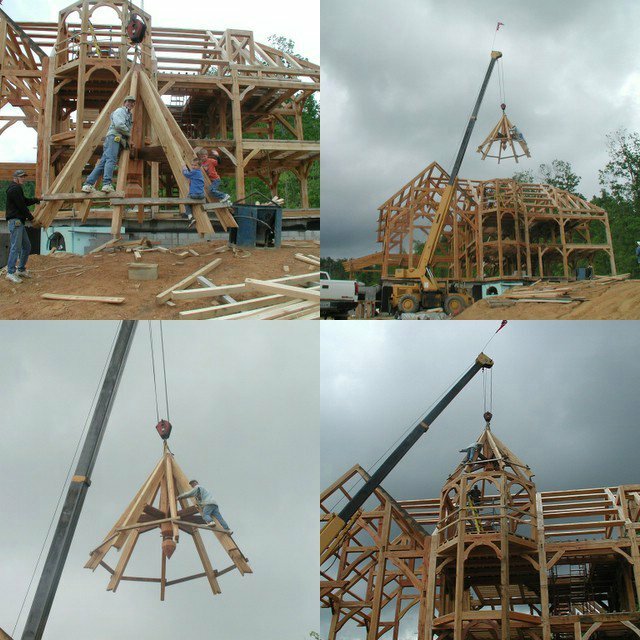 Lots of work left to do, but the timber frame has been raised! Deep down inside, I am terrified of heights. Slowly though, in the process of working on this house, some of that fear (common sense?) has eroded. Monday morning, we pulled the tower top assembly from the barn, placed it on a car trailer and towed it up to the house site. As we climbed up and down the tower top, carefully rigging it for its final flight to the top of the house, an inevitable thought struck me... I was going to ride this thing to its final resting spot, 45 feet above the basement slab. The assembly was so heavy that it barely tipped when I jumped on it a mere 12 inches from the ground. My brother-in-law operated the 1974 Grove antigravity device and the flight was smooth. At one point, I made the mistake of looking through the rafters, past the pendant, down the boom, and into the cab of the crane. It was exhilirating thinking about what might happen if the crane tipped, and just before I locked up, I looked back toward my intended destination - the top plate of the house (now at eye level). 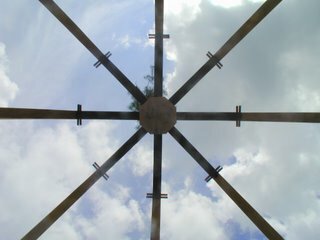 Four of the rafter feet dropped into position just as they were supposed to, but the other four feet needed convincing. I jumped down from my perch, and my father-in-law and another friend climbed up to the tower and, using the big mallet and a ratchet strap, we persuaded the other four rafter feet to find their places on the top plates. 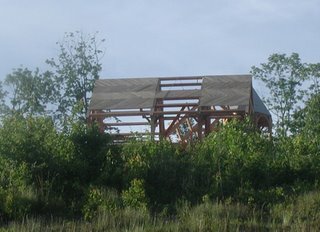 We knocked off the old poplar 2x4's that were holding the tower top into its rough shape, and the tower top settled into position. There were gaps here and there, but those could be resolved "tomorrow." It was time to nail our pine bough (aka Christmas tree) and hang an American flag on the top of the completed frame. As it turns out, the ground beneath our farm contains several even beds of fine grained sandstone (aka siltstone). 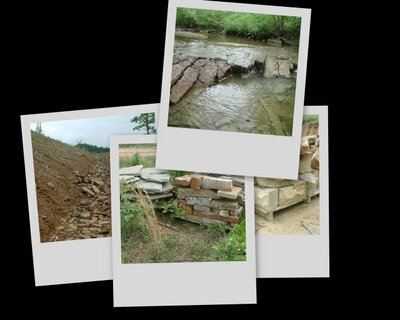 In fact, sandstone was once quarried in our county (100 years ago) and sent all over the country (e.g. Chicago and New Orleans). Evidence of that the stone was once highly valued can still be found -- our stately courthouse is built of it (c.1939) , and abandoned quarries are still marked on the topo maps. Unfortunately, most of the knowledge of how to work this stone disappeared when the quarry workers passed away. The stone is hard to ignore on our farm ... it pops out here and there on old eroded logging roads, and 12" waterfalls flow over the exposed beds in the creeks. Where the weather has liberated the stone completely from the ground, it usually comes out in nice rectangular chunks. 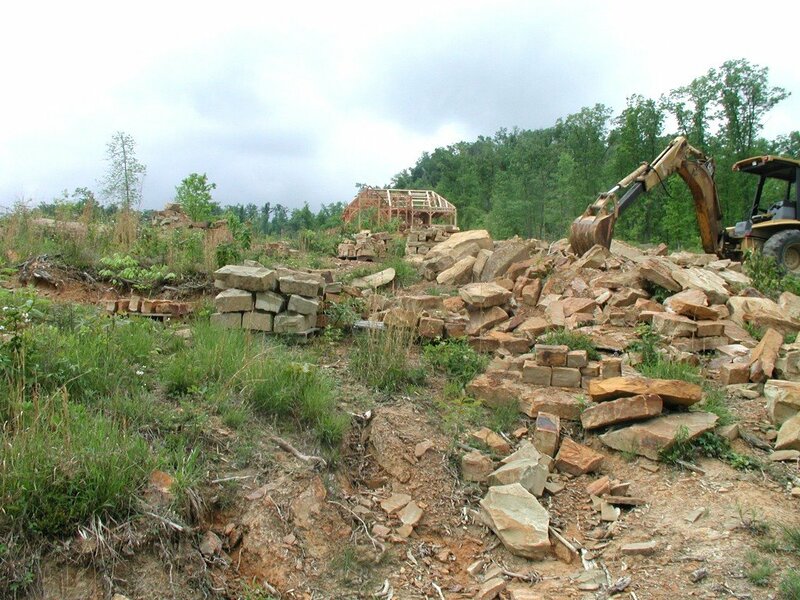 It was slow going clearing the ground for our house site, because everytime I saw a rectangular rock, I had to jump off the dozer and put it in my "save" pile. Surely these "freestones" deserved a place in our house. Building the road to our house site unearthed even more nearly-square stones, but it was clear that many more stones would be needed for our timberframe house. And a lot of these freestones would need "working." I showed my collection of stones to a Welsh stonemason and to Mr. G, my 7th grade science teacher (who, among other things, is the resident authority on local geology). When asked whether these particular stones were worthy of building a structure that would last hundreds of years, they both answered emphatically - "of course!" I met the Welsh stonemason through a friend of a friend. He showed up for several days, splitting the rocks with chopsaw and chisel, and facing the resulting rectangles with a chisel and mallet. The look was nice, but my wife worried that they were almost too formal... "it'll make our house look like the courthouse," she said. I worked beside him for a few days, serving him lemonade, and listening to his windy stories about all the things he had done in life and all the things he could do. After making about 6 pallets of stone (and getting paid for the 6th) the stonemason failed to show up one day. In fact, that was over a year ago and I haven't seen him since. (I later heard that he had a nasty break-up with the friend's friend.) Fortunately for me, he left me with his hammer and chisel and a little bit of know how. After he left, I made about one more pallet of stone in his "pitch faced" style. Man, it was rough work. I was starting to see why all of the quarries were abandoned in our county! Through out all of this, Mr. G. had been dropping by and telling me that you could split this stone easily with something like a log splitter. The stonemason had vehemently disagreed with this proposition... "Sounds like a typical American idea! hmmmph! Why, you'd have no idea of where the fracture would occur, if you didn't do it by hand, chisel, mallet, and use a keen eye." But the stonemason was now long gone, and I needed at least 40 more pallets of stone for my house. For ships-and-giggles one day, I borrowed a hand operated log splitter and put a rock in it. Mr. G stopped by just in time to see me try this... pump, pump, pump... craaaaaaaaaack! A perfectly square split with nearly zero effort. He didn't even need to say "I told you so"... it was ringing loudly in my head as soon as the first stone cracked. Version one worked, but it worked like... uh let me search for the word... ah there it came to me... it worked like crap. It split rock, but not consistently where we wanted it to split. We split about 50 rocks with it, but our scrap pile was growing faster than our "keep" pile. 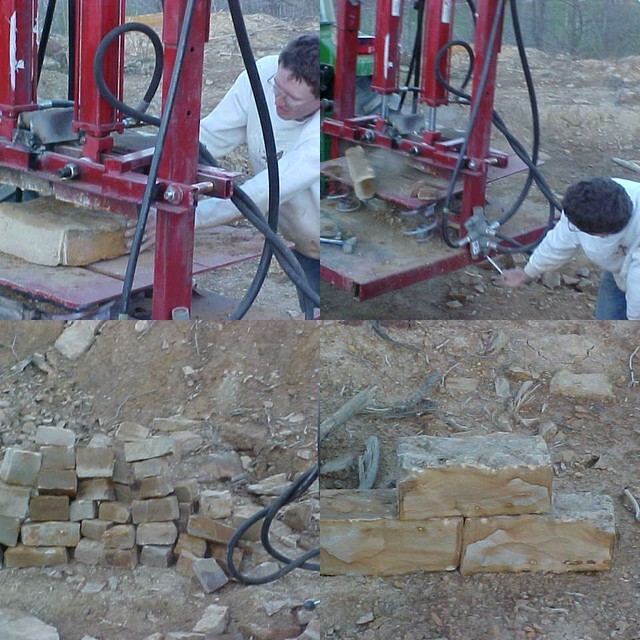 The splitter even stalled out on a few wimpy 6" thick rocks - clearly we would need that second hydraulic cylinder. Glad the stonemason wasn't around to see Version 1! Back to the drawing board... or should I say, back to the (web)crawling board.... We set aside our waning pride and got on-line and looked at some giant commercial versions of stone splitters. We scrutinized, we slowed down the video clips, we studied. Aha, Mr. G. spotted it first. "Go back to that frame... you see that... the bottom table moved a little... it floats on springs and there are wedges on the bottom too - that come up through the table." That _was_ the secret. Mr. G. went to the local junk yard and found some car springs. (The proprietor wanted $1, Mr. G. offered 50 cents and they begrudgingly settled on 75 cents. This is how business gets done in eastern Kentucky. If you're not from around here and/or unfamiliar with the dance, you'd better just pay the asking price... or you'll leave the junk yard without any springs and no amount of money will buy them.) I got on line and ordered two more log-splitter wedges. Version 2 (shown here), debutted 2 weeks later, and worked like a charm. In less than 8 hours, we split at least as much stone as the stonemason had in about 30 hours. (and we were making good stone out of the ones that he had rejected because they would have been too much work to square up by chisel). 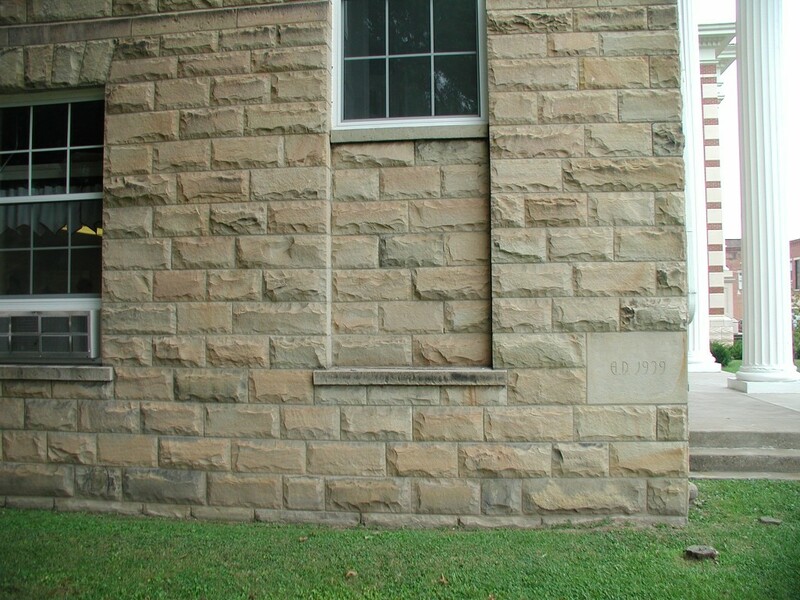 Furthermore, the stone split so squarely and so consitently with a clean natural face that we didn't have to "work" the faces with a chisel - quelling my wife's concern that our house would look too formal. Mr. G. busted version 2 last week on a particularly stubborn rock. In retrospect, the piece that broke was embarrassingly undersized for the job. So, after one more trip to the local metal-yard, we now have the parts to build version 3 (which is basically just version #2 beefed up). Preparing to cap the tower! It turned out that even thought he maple log had decayed somewhat on the ends, it was full of curly (or fiddleback) figure and some nice spalting too, and there would be enough sound wood in this log to make 4 more bookmatched pairs of braces to match the curly beech braces. I have no idea what the commercial value of this log might have been, and I'm not going to worry about it, since it would have rotted if I hadn't pulled it out of the woods after the ice storm. 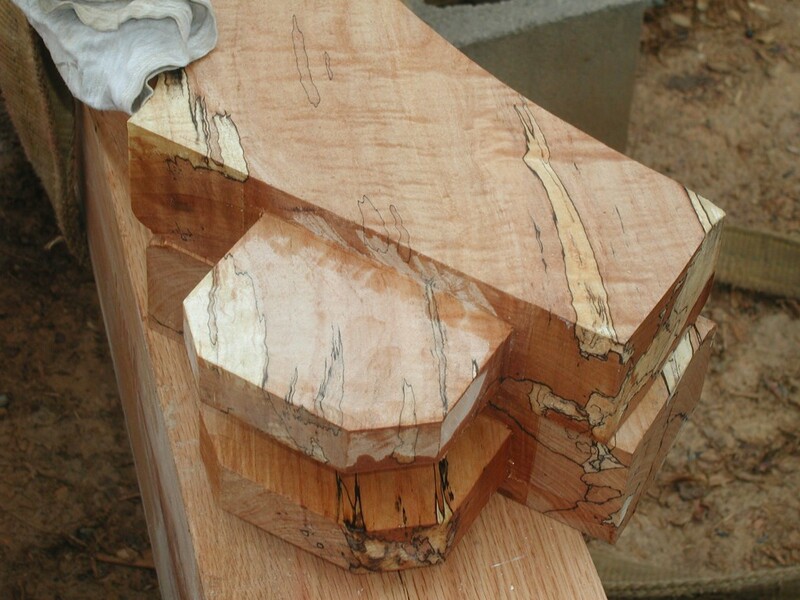 I saved a lot of offcuts (scrap) that was created when we cut the braces on the sawmill. Maybe someday I can have a fiddle-back banjo made from these pieces. Speaking of fiddle-back, aligning the braces took _a_lot_ of fiddling. 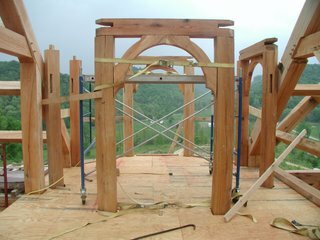 In fact, when we were done, two of the brace pairs had large gaps that we'll have to go back and shim later for aesthetic reasons. Ultimately, we got the 8 corners of the octagon that was formed by the top plates to line up within 1/4" of the measurements of the rafter feet of the tower top (already built, waiting in the barn). The measurements were a little "big," so we're confident the tower top will drop into place - then we can try to close the gaps with ratchet straps. Yesterday we put the front of the tower on to the house frame. It went pretty smoothly, and the custom braces we made for the tower fit better than I expected they would. 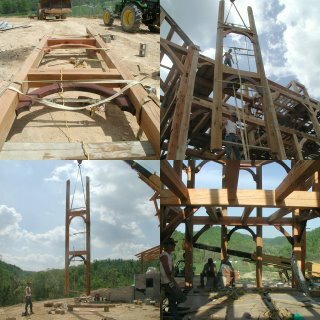 The picture to the left was taken from the crane bucket, after we pegged the tower posts. From this angle, you can see the oak 3x3's (12" o.c.) that we've been putting down for a sub floor (instead of plywood). As it turns out, I had made a significant design error in the long posts that I didn't discover until yesterday. I might have tried to blame the mistake on someone else (who laid out this beam!? who cut these mortises?! ), but when you've got the same mistake replicated 4 times on two different posts, it's pretty clear that cut-copy-paste was involved in that kind of mistake! (to err is human, to really screw things up takes a computer). The angled girts that connect the posts to the main house are 8x8's with 2x8 tenons. 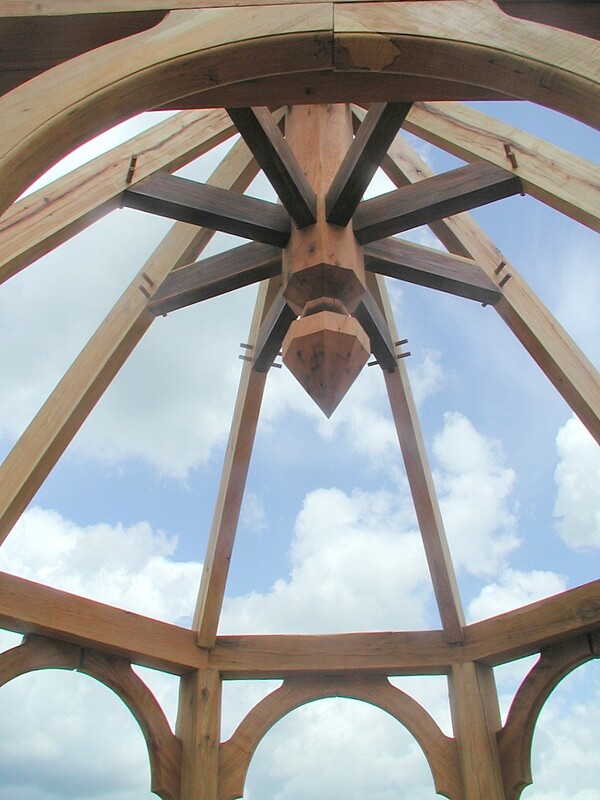 But the mortises in the tower posts were 2x10. No issues, we just manufacturered some "faux splines" on site and put them in the bottom of the mortises... you can see them clearly to the right and left of the braces in the close up photograph of the braces. 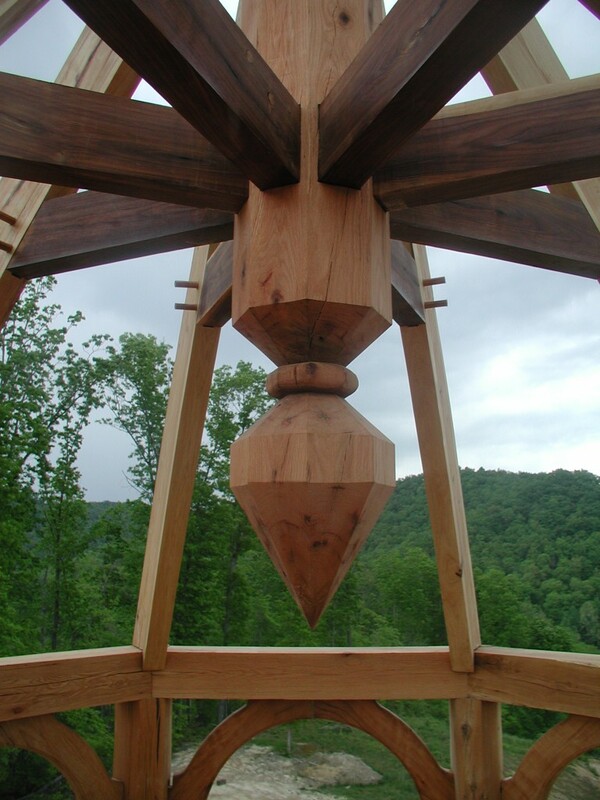 Everyone agreed with me (under duress of thirst and with the prospect of cold beverages on the horizon), that these faux splines looked great, and surely if we do another tower, we'll incorporate the same mistake as a design element. 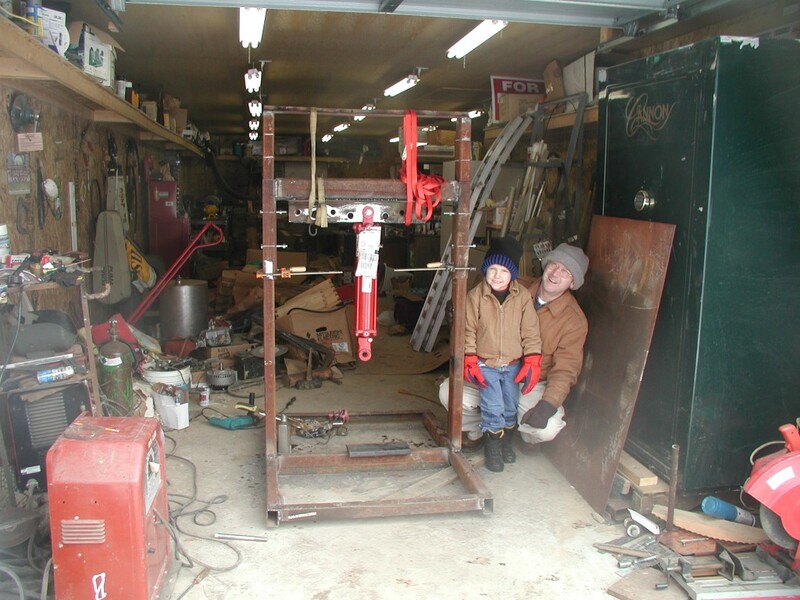 The two very long posts were bowed considerably (at least an inch each), but they straightened out when we pulled them to each other and then tight to the main frame. We used a 2x4 to spread the feet of the posts so they would line up with the mortises in the sill when we flew the assembly to the mortises. After the post tenons dropped into the mortises, I just kicked the 2x4 spreader out on to the ground and the post feet stayed right where they belonged. You can see the raising sequence to the left. A friend arrived just in time with a small cooler full of ice and aluminum cans. After grinding my timberframe project to a stand-still a few months ago when I struggled with the hip rafters (and their associated "compound mortise and tenons"), I was very leery of introducing any more complicated compound joinery in to my timber frame. So, when it came time to do the valleys on my house, I wanted to K.I.S.S. I didn't want to completely cop-out and use stick framing for the valleys (not that I'd be any better at that, but I'm told it's easier). One reason not to use stick framing is that I have a loft on the 3rd floor that has an open view into the great room. I wanted the look and feel of the ceiling in the vicinity of this loft to match the rest of the house. What I started with was similar to the stick-frame approach to valleys. 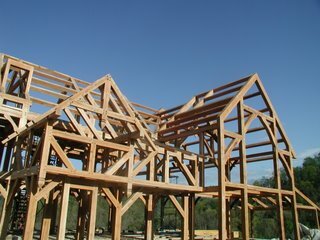 In stick framing, they sometimes just build the entire roof of one house and then rest the intersecting roof on this built roof. I framed the main roof (with common purlins) just as if it had no intersecting roof. I ommitted the typical valley rafter. 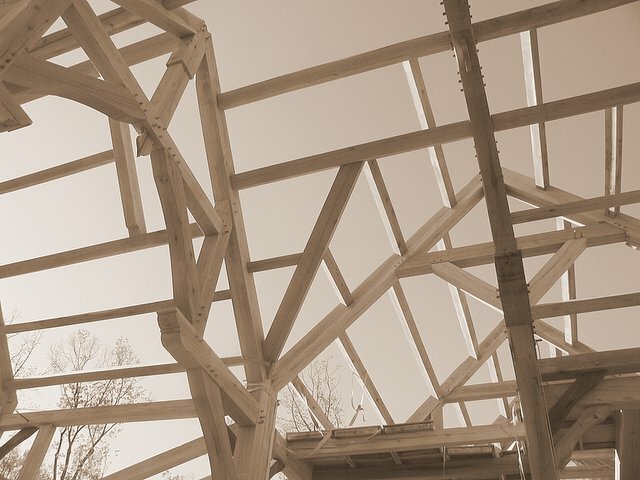 Then when it came time to connect the intersecting roof, I just had the purlins from the intersecting roof simply meet and rest upon the purlins of the main roof. 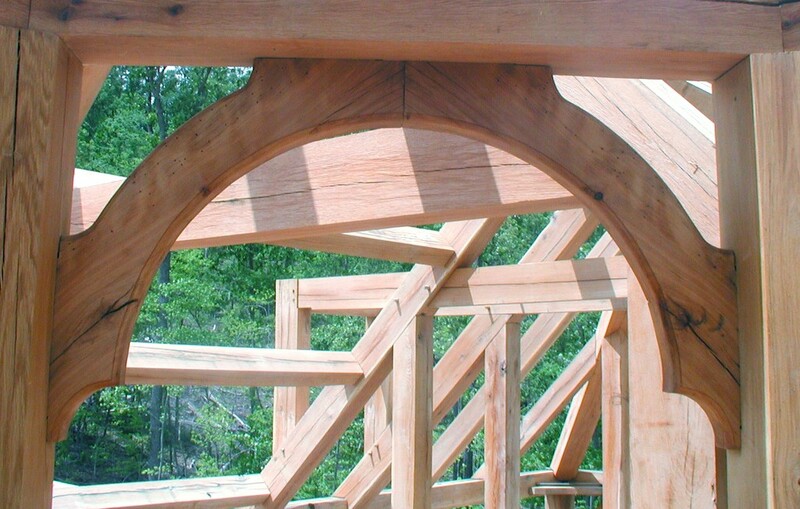 Assuming both of your roofs have the same pitch, you can find the angles for cutting the ends of these intersecting purlins on your speed-square. 8 of 8 main bents are raised! Whew, the last main bent is finally up. This last bent is the one directly above the black section of the crane boomin the photograph. I designed it to mimick the proportions of the adjacent hammer beam, but like the opposite gable end of our "hall," this bent has four posts that go from the ground to the rafters. This four post design is almost universal in the tobacco and livestock barns in our area (including 5 barns on our farm). 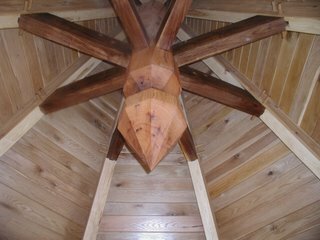 The two central posts keep the middle of the rafters from sagging, and also tend to balance the loads to reduce the tendency of the rafter feet to spread. In this picture of the last main bent, you can see 4 open mortises on the east faces of the four posts. After we finish drying-in the house, we'll go back and connect four "porch" purlins to this bent. 3x6 white oak porch rafters will rest on these purlin, and form the roof of the porch... but that's a long time from now. 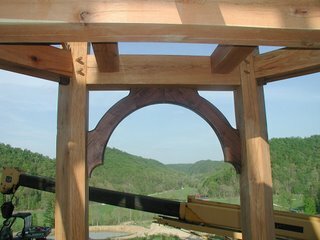 We've yet to pour (or lay up) the piers for the porch posts, since they would be in the way of the crane at this point. Only the tower frame remains before we can start boxing in the frame and roofing it! The tower will be centered on the bay directly above the crane hook in this picture. The mortises, eager for the tower connectors, are visible in this picture.